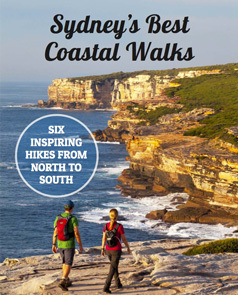 The Palm Beach to Manly Walk is a 50km coastal walk traversing Sydney's entire northern coastline. It's part of Sydney's Great Coastal Walk. Start with the Barrenjoey Lighthouse Walk to Sydney's northernmost point. It's well worth the short, steep climb for the 360 degree views of Palm Beach, Pittwater and north over the Hawkesbury to the Central Coast. Finish at North Head, near Manly, for a breathtaking view down the harbour to Sydney's city skyline. While it's possible to complete the entire Palm Beach to Manly walk in one day – and many people do for the Bloody Long Walk charity fundraising walk – they're walking it for a cause and the physical challenge. Instead, you may want to take your time and enjoy the sights. How Hard is the Barrenjoey to Manly Coastal Walk? Mostly paved walkway, some maintained bush track and a few long sections of soft sandy beach walking. Regular bus service between the city and Palm Beach. Regular ferry or bus between the city and Manly (jump to more details in Getting There below). Refill water bottles at Surf Life Saving Clubs at beaches throughout the walk. Toilets can be found at Surf Life Saving Clubs at regular intervals throughout the walk. There is good mobile phone reception along the track. Here are our itinerary suggestions to complete the Palm Beach to Manly Walk in between two and four days. Day 1: Barrenjoey to Narrabeen Lakes. 25km / 15.5 miles, 7.5 hrs. Day 2: Narrabeen Lakes to North Head, via Manly. 26km / 16 miles, 7 hrs. Start your great coastal walk by doing the Barrenjoey Lighthouse Walk loop. Sure, you're starting by walking up a hill that you have to walk back down again, but the view is well worth the short, steep climb. You also get a real sense of standing on Sydney's northern tip as you look across the Hawkesbury to the Central Coast. The rest of the day involves walking over a few smaller headlands on roads and tracks and walking some beaches and suburban streets to stay at either the Quality Hotel Sands or the NRMA Sydney Lakeside Holiday Park, both at Narrabeen (check prices and availability for accommodation near Narrabeen). You could also try the Sydney Beachouse YHA at Collaroy Beach. This is a slightly longer day in distance but a lot of it is over long, flat stretches of sandy beaches. Walk in the wet sand at the water's edge where it's easier walking. If you take your shoes off remember to dry your feet thoroughly and remove all traces of sand. Even a couple of grains between your toes is enough to give you blisters. Finish your day with harbour views before a short walk to Q Station (check availability) to celebrate your achievement. Day 1: Barrenjoey to Newport. 20km / 12.5 miles, 6 hrs. Day 2: Newport to Manly. 21km / 13 miles, 5.5 hrs. Day 2: Manly to North Head. 11km / 7 miles, 3.5 hrs. In the two day itinerary, I recommended you start your great coastal walk by doing the Barrenjoey Lighthouse Walk loop, and I still think you should. Yes, you're adding the steepest, most challenging section to your walk, but the view is worth it. The rest of the day is a relaxed walk to Metro Mirage Hotel Newport (check availability), so you may as well climb Barrenjoey Headland. Once again, like the two day itinerary this is the longest day in distance but it's easy beach walking. Walk in the wet sand at the water's edge and remember to dry your feet thoroughly if you take your shoes off. Sand in your shoes = blisters. Finish your day at Manly Beach where you can choose from a variety of places to stay. Novotel Manly Pacific and The Sebel Manly Beach are two hotel options and there are holiday apartments, B&Bs and hostels. Check prices and see all Manly accommodation. Complete your three day Palm Beach to North Head walk with a half day stroll around the old gun emplacements and military installations of North Head. Surrounded by coastal scrub full of banksia flowers, it's a sharp contrast between the natural and the man-made. Emerge from the bush at North Head for views to South Head and the Watsons Bay Walk and down the harbour to the city. The 11km for this day includes the walk back to Manly wharf, but you can also catch the bus. Better yet, treat yourself to a night at Q Station (check availability) to reflect on your Barrenjoey to Manly walk. Day 1: Barrenjoey to Avalon. 12.5km / 8 miles, 3.5 hrs. Day 2: Avalon to Narrabeen Lakes. 12.5km / 8 miles, 3.5 hrs. Day 3: Narrabeen Lakes to Manly. 15.5km / 9.5 miles, 4 hrs. Day 4: Manly to North Head. 11km / 7 miles, 3.5 hrs. Now you have four days for the Palm Beach to Manly walk, there is no reason not to include the Barrenjoey Lighthouse Walk loop. Avalon Beach is just over the headland from Palm Beach so you don't have far to walk. Avalon has a backpackers and a couple of houses for rent. Check prices and see all northern beaches accommodation or take a look at AirBnb. Today involves walking over a few smaller headlands on roads and tracks and walking some sandy beaches. NRMA Sydney Lakeside Holiday Park (check availability) is on the main walking route from Palm Beach to Manly so you don't need to detour. If you've read the previous itineraries you'll know this is the longest day in distance but it's fairly easy beach walking. Take your shoes off, walk along the water's edge and go for a swim. Remember to wash the sand off your feet before your socks and shoes back on. Complete your four day walk from Barrenjoey to Manly with the North Head Walk. There are some sections where you can't see any man made structures and then you stumble across concrete WWII bunkers surrounded by bush. It's a great contrast. The views to South Head, the Watsons Bay Walk and down the harbour to the city are spectacular. If you don't have a plane to catch, treat yourself to a night at Q Station (check availability) to soak up the harbour while reflecting on your walk. Whether you're walking Barrenjoey to North Head or Palm Beach to Manly, the walking route is pretty simple. Keep the ocean on your left. If you prefer to walk from Manly to Palm Beach, or North Head to Barrenjoey, keep the ocean on your right. Remember, if you're walking north the sun will be in your face. The old Irish blessing “May the wind always be at your back, May the sun shine warm upon your face” wasn't written about walking in Sydney, particularly in summer. Where to Start the Palm Beach to Manly Walk? If you're doing the Barrenjoey Lighthouse Walk, start on the western, Pittwater side of the peninsula, rather than the Palm Beach side. At the far northern end of Governor Phillip car park, is a signed walking track to Barrenjoey Headland. The track is well-marked. There are two routes to the top, the more genteel Access Trail or the shorter, but steeper, Smugglers Track. Take the Smugglers Track for the best views. About halfway up is a great photo spot overlooking Palm Beach. If you don't fancy the walk up Barrenjoey Headland, start on the eastern, Palm Beach side of the peninsular. From the car park or the bus stop head east until you meet the beach. Turn right and you're on your way. Palm Beach, or “Palmy” is as far north as you can get in Sydney. It’s right on the tip of a long peninsula – 45 kilometres (28 miles) north, and a little over an hour drive from the city centre. The walk finishes at North Head, Manly. Catch the L90 bus from Railway Square, Sydney. It’s a long bus trip – about 1.5 hours and it's a 1.5 km (1 mile) walk from the bus stop to the start of Barrenjoey Headland. Alight on Beach Road, near Palm Beach Golf Club. Walk north along the road keeping the golf club on your left and Governor Phillip Park on your right. Continue past the golf course and Palm Beach Boathouse on your left, until you reach the car park. Catch the 135 bus from North Head. The stop is right beside Fairfax Walking Track on North Head Scenic Drive. It will take you to Q Station (check availability), if you're staying the night, and Manly Ferry Wharf if you're catching the ferry back to the city. It’s a delightful 30 minute ferry ride across the harbour to Circular Quay. Or 20 minutes if you pay slightly more for the privately operated Manly Fast Ferry (note an Opal card is not valid on this service… but you can buy beer: decisions, decisions!). Check Transport NSW for detailed trip itineraries and latest public transport information. Let’s assume you’re driving from Central Station near the city’s central business district. In theory, it’ll take about 1 hour heading north over the Harbour Bridge to drive to Palm Beach (45km), or 35 minutes to get to Manly (17km – go over Spit Bridge and turn right at the top of the hill). In peak times it may take much longer. Refer to Google Maps for exact details from your address. There is plenty of short term parking around Palm Beach and costs $4 per hour for up to two hours. Council inspectors enforce the ‘Pay and Display’ system where you purchase a ticket from machines at the carpark, displaying it on your dashboard. If you want to leave your car here for the duration of your walk try parking in a side street, off Beach Rd, for free untimed parking. The 199 bus will get you from Palm Beach to Manly in 80 – 90 minutes. If you want to park at Manly and catch a bus to Palm Beach to start your walk, it's hard to find free or even low-cost all-day parking. Private company, Secure Parking, operate the carpark right at Manly Wharf, underneath Aldi. It can be expensive – $59 for more than three hours (weekdays and weekends) – so take advantage of “Early Bird Parking” on weekdays only. This will cost $35 ($25 if booked ahead online), as long as you arrive between 7:00am – 9:30am and leave between 4:00pm – 7:00pm. There’s another Secure Parking at 25 Darley Road, maximum $30 weekdays and weekends. Find more here. The four council-run car parks are free for the first two hours but you’ll definitely be longer than that, so risk spending up to $41 for the full day. Those car parks are in Central Avenue, Whistler Street and Wentworth Street. Check Northern Beaches Council carpark information. While Palm Beach is 30km from Manly by road, heavy traffic could see the 50 minute drive becoming much longer – not great for a taxi fare but okay if you’re carpooling. We believe walking from Palm Beach to Manly is better because the sun is on your back and the reveal of Sydney Harbour is more exciting. BUT…! It's still an awesome walk no matter which way you do it! So walking from Manly to Palm Beach is completely fine. Just read our track notes in reverse for the Manly to Palm Beach Walk. There are more than ten swimmable beaches along the walk, most of which have Surf Life Saving Clubs. Always swim between the red and yellow flags. If the flags are crossed it means the beach is closed due to dangerous surf conditions and swimming is not permitted. With this walk weaving in and out of beachfront suburbs, you’re spoiled for choice with cafes en route to Manly. Manly has plenty of coffee, gelato, takeaway eateries and restaurants. Chic Hugos Manly has great pizza and views from the end of the wharf. Try 4 Pines Brewing Company for local craft beer and gourmet pub food (just past Manly wharf). Grab quality fish and chips dine-in or takeaway from Fishmongers Manly. Banana Blossum has huge, healthy salads made fresh to order, eat-in or grab-to-go. This section contains affiliate links which means we may earn a small commission (at no cost to you) to help offset the costs of running this website. There are only a couple of typical accommodation places at the northern end of the Barrenjoey to Manly walk. Metro Mirage Hotel Newport (check availability), is a good hotel option if you're doing the walk over three days. You'll have a 1.5km detour off the main walking route to get there. You might like to look for an AirBnb near Bungan Head instead. NRMA Sydney Lakeside Holiday Park (check availability) is a good halfway point for the two day walk. Check prices and see all northern beaches accommodation. At the end of your walk, Manly has plenty of places to stay. Novotel Manly Pacific and The Sebel Manly Beach are two options and there are holiday apartments, B&Bs and hostels. Check prices and see all Manly accommodation. Of special mention is Q Station (check availability) at Manly, meticulously converted from the original Quarantine Station. Situated in Sydney Harbour National Park, it has harbour views, its own sandy beach, good food and a feeling of getting away from it all. then you can do the Bondi to Coogee Walk and then you've nearly completed all of Sydney's Great Coastal Walk in full. Go on, you know you want to! Things to Do in Manly for people who love the outdoors. Seriously, this beachside area is just asking for more time to explore it. 24 Hours in Sydney's Outdoors – itinerary suggestions to make the most of Sydney's natural areas in a limited time. 1001 Walks You Must Do Before You Die – The Spit Bridge to Manly Walk is one of four Sydney walks that feature in this definitive guide. Make sure you do them all while you're in Sydney, and get inspiration for more walks around the world. If you're loving this side of Sydney Harbour, try the Bradleys Head Walk near Taronga Zoo for a different perspective. Prefer to leave the buildings behind and escape to the trees? Try Wedding Cake Rock or Figure 8 Pools in Royal National Park, on Sydney's southern border. Tagged Manly, Northern Beaches Walks, Palm Beach.